I may suggest adding a piece of MoonGel to mute the long ring a bit, unless you like that kind of sound which is cool also. Or, in Cubase, mess around with the gating a little. 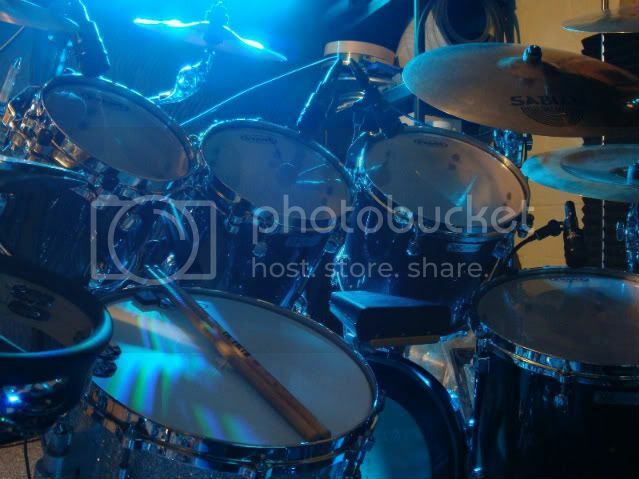 But I have another question, how are you positioning your mics on your toms? Yeah, I was hoping someone would notice my peculiar Tom mix positions. In a nutshell, the reason for this is because of my 'bastardised' kit: I bought the PDP kit from the dudes at Billy Hyde Drumcraft in the city: They had been using it as a demo kit, and it came with two Pearl I.S.S mounts for the rack toms, and one of the PDP mounts for the floor tom. These mounts prevent me from using the Audix DP7 'mic clips' at the top of the tom (as the rim is being blocked by the mounts!). As such, until i purchase mic stands, i do not have much flexibility in Tom positions. When i DO get around to it, where do you suggest i place the microphones? 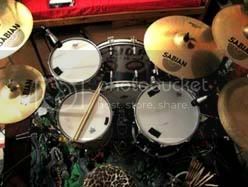 In addition, I'm keen to learn more about positions of mounting two mics on a snare, particularly in a 'mirror image'. Incidentally, what is phase reversal, and when is it handy? Im not 100% sure the saffire pro has this integrated into the mixer. Is it something that could be added post production? Mic placement rules are very subjective to the sound you're looking to acheive. Mirror image means placing the microphones in identical positions, but reversed. 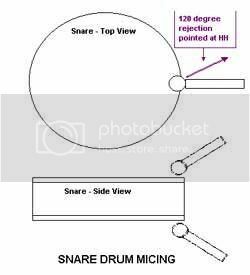 If say your top snare mic is placed at 12o'clock, at a 45degree angle, and aimed at the center of the head, than the bottom mic should be placed in the same position but aimed at the center of the bottom head. (see diagram below I snagged from google). This creates a phase problem which simply can cause distortion as their are two mics on the same sound source. Most mixers have a switch to fix this. I like to place my mic at the 11 or 12 o'clock to reduce hihat bleed. For tom mic's I use Audix D2 & D4 and I've found that have the diaphram about an inch inside the rim at about a knuckles height off the head aiming at the center gives me the sound I'm looking for. Here's another good picture I found showing the mirror image technique. And here's a pretty good shot of how I mic my toms. Sounding much better. That ring is because one or more of the tension rods are a little loose. You guys ROCK! Cheers for the further tips- SGarrett, i know I may sound like a newbie (and i should because I AM), but the tension rods are the 10 drum-key shaped rods around the snare used for tuning, is that correct? The reason i ask is, the Pearl snare I have has additional 'tension' brackets around the shell, gold in colour, which can be modified using a flat head screwdriver. I've never had to touch these so I'm not sure what they do! You're very welcome. I know guys who've been playing for 30+ years that will straight up say "I can't tune my way out of a wet paper bag". So don't feel bad for being new. Yeah, the tension rods are the long screws that you turn with the drum key. Well, your version of that song is a lot more exciting and technical that the other guy's. It sounds like either you need to tighten your head up or replace. It looks really worn in the middle. crank your snare up and add as much reverb as your pcu will let you. that will get you closest without buying a new snare.